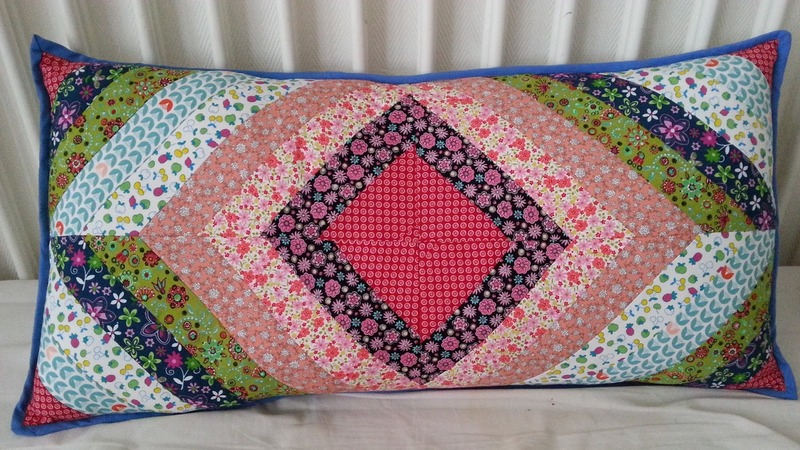 Finally I finished this diamond strings pillow from craftsy by Maureen Cracknell. I am supposed to do two pillows for my two daughters its just that I have to prioritize other stuff for the moment but in no time I will do start and finish the other pillow as well. I am not good in fabric combination, whenever I sew I just mix up fabrics that I like thats why the result is like this. 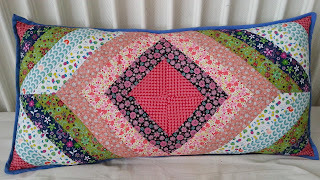 I made a free motion quilting for the first time at the back part of this pillow and since I am not so proud of it because I just made it "n'importe quoi" as my children will say it in french meaning whatever. Whenever I see quilters do free motion quilting I always thought it is so damn easy, but when I tried it oh my goodness it is not so easy as it seems. Fabrics are from stash - stoffenspektakel, chamick and veritas, also used cotton batting and ready made bias tape.